These young Angus enthusiasts won top honors in junior A showmanship at the 2018 Eastern Regional Junior Angus Show, June 15-16 in Lima. 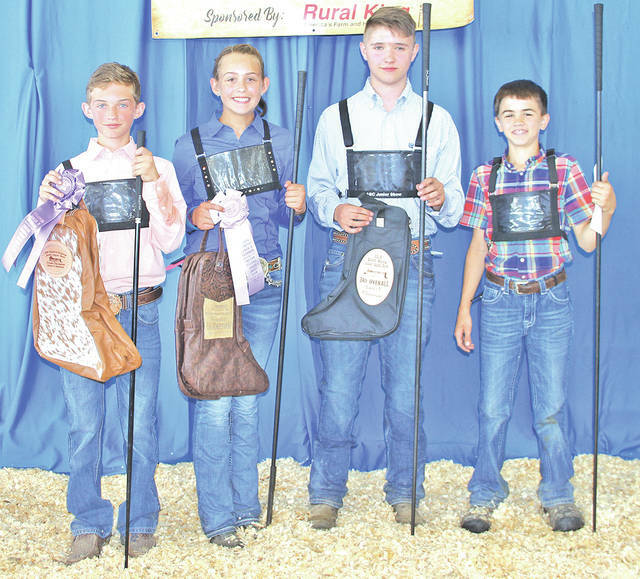 Pictured, from left, are Carly Sanders, Leesburg, first place; Maggie Davis, Bidwell, second place; William Miller, Gridley, Ill., third place; and Caden Crain, Mounds, Ill., fourth place. These young Angus enthusiasts won top honors in junior B shomwanship at the 2018 Eastern Regional Junior Angus Show, June 15-16 in Lima. Pictured, from left, are Schyler Crocker, Selma, N.C., first place; Sydney Sanders, Leesburg, Ohio, second place; Suter Clark, Gretna, Va., third place; and Adam Miller, Gridley, Ill., fourth place. https://www.timesgazette.com/wp-content/uploads/sites/33/2018/06/web1_Showmen-pic-1.jpgThese young Angus enthusiasts won top honors in junior A showmanship at the 2018 Eastern Regional Junior Angus Show, June 15-16 in Lima. 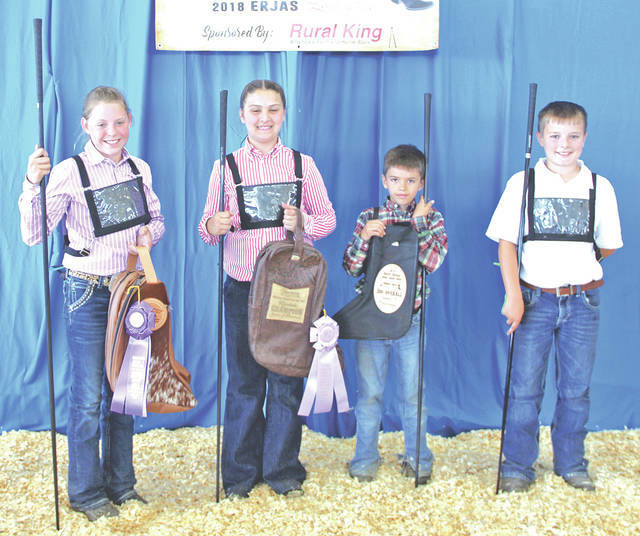 Pictured, from left, are Carly Sanders, Leesburg, first place; Maggie Davis, Bidwell, second place; William Miller, Gridley, Ill., third place; and Caden Crain, Mounds, Ill., fourth place. https://www.timesgazette.com/wp-content/uploads/sites/33/2018/06/web1_Showmen-pic-2.jpgThese young Angus enthusiasts won top honors in junior B shomwanship at the 2018 Eastern Regional Junior Angus Show, June 15-16 in Lima. Pictured, from left, are Schyler Crocker, Selma, N.C., first place; Sydney Sanders, Leesburg, Ohio, second place; Suter Clark, Gretna, Va., third place; and Adam Miller, Gridley, Ill., fourth place.